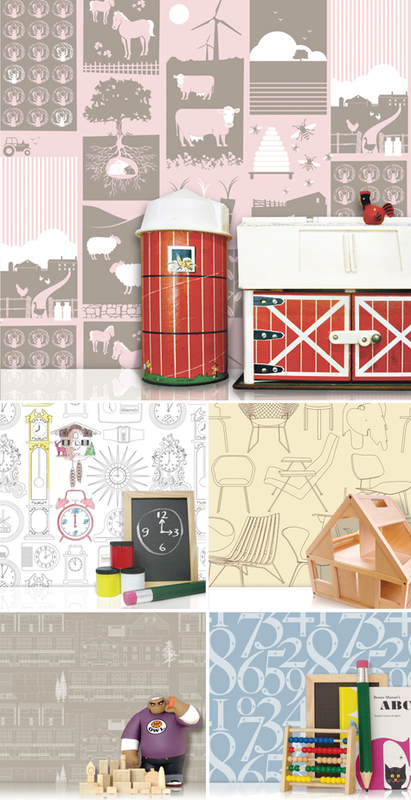 Above is a sampling of the darling selection of wallpapers by Mini Moderns - a range of interiors products for kids and kidults, designed and produced by London based design and branding agency, Absolute Zero Degrees. Their designs bounce between trendy colour schemes and black and white patterns that are meant to be coloured by kids. I feel like the awful Photoshop cut and paste objects with drop shadows really detract from the modern simplicity of the wallpaper! Some designs are available at Bodie and Fou. oh btw - the items are in shot to show scale of print which we are always asked about swatch images are always available on stockists site so you can see the pattern close up. And they are photographs that are taken in front of the wallpaper apart from the tall farm building which was severly discoloured in the shoot - there is no photoshop work apart from a little colour adjustment to make sure they represent the paper in their correct colour schemes. thanks for featuring us.